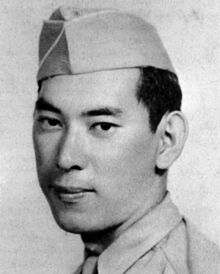 Robert Toshio Kuroda (November 8, 1922-October 20, 1944) was a United States Army soldier. He received the Medal of Honor because of his actions in World War II. Kuroda was born in Hawaii. He was the son of immigrants who were born in Japan. He is a Nisei, which means that he is a second generation Japanese-American. Kuroda joined the Army in March 1943. Kuroda volunteered to be part of the all-Nisei 442nd Regimental Combat Team. This army unit was mostly made up of Japanese Americans from Hawaii and the mainland. For his actions in October 1944, Kuroda was awarded the Army's second-highest decoration, the Distinguished Service Cross (DSC). In the 1990s, there was a review of service records of Asian Americans who received the DSC during World War II. Kuroda's award was upgraded to the Medal of Honor. In a ceremony at the White House on June 21, 2000, his family was presented with his medal by President Bill Clinton. Twenty-one other Asian Americans also received the medal during the ceremony, but only seven of them were still alive. Kuroda's Medal of Honor recognized his conduct in frontline fighting in France in 1944. Without help from others, he destroyed two machine gun nests. Kuroda attacked two enemy machine gun positions. During the fighting, he was killed by a sniper. Robert Kuroda is the namesake of the US Army logistics support vessel, the USS Robert T. Kuroda (LSV-7). A parade ground at Fort DeRussy in Honolulu is named after Kuroda. ↑ 1.0 1.1 Kakesako, Gregg K. "Honoring a war hero," Honolulu Star Bulletin. August 31, 2003; retrieved 2012-12-7. ↑ 2.0 2.1 US Army Center of Military History (CMH), "Medal of Honor Recipients, World War II (G-L)"; retrieved 2012-12-7. ↑ Bramlett, David A. "Go For Broke Monument, Fifth Anniversary Tribute," June 5, 2004; retrieved 2012-12-7. ↑ U.S. National Archives and Records Administration (NARA), WWII Army Enlistment Record #30104463 (Kuroda, Robert T.); retrieved 2012-12-7. ↑ Go for Broke National Education Center, "Medal of Honor Recipient Staff Sergeant Robert T. Kuroda"; retrieved 2012-12-7. ↑ Gomez-Granger, Julissa. (2008). Medal of Honor Recipients: 1979-2008, "Kuroda, Robert T.," pp. 12-13 [PDF 16-17 of 44]; retrieved 2012-12-7. This page was last changed on 5 May 2018, at 18:36.